The Great Lift at Raldbthar is a Dwarven lift to Blackreach located west-southwest of Anga's Mill in the mountains. The Great Lift at Raldbthar is a mechanical lift which can only be used and entered after starting the quest, Discerning the Transmundane. Inside the lift is a lever which, when activated, will bring you up or take you down into Blackreach. The top-side of the lift is surrounded by metal barriers, one of which is a gate. 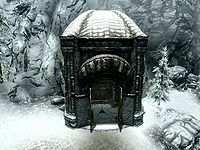 The gate can only be opened from within, by pulling a lever directly to the right of the gate, after which the lift can be entered from Skyrim anytime you travel there (fast traveling puts you right outside the lift). The map marker for this location does not appear until the lift is activated inside Blackreach. The lift is Dwemer in origin and is one of seven ways into Blackreach, which must first be entered by traversing the ruins of Raldbthar, Mzinchaleft, or Alftand and using the Attunement Sphere from Septimus Signus to open a door to Blackreach. It is the first building passed when following the path that starts near the Pale Stormcloak camp on Lake Yorgrim leading up to the main entrance to Raldbthar. It is found above the snowline. The exit in Blackreach brings you out north-northeast of the Derelict Pumphouse, at the same level as the top of the lift in the Pumphouse, on the shore of a large pool. Before using this lift to enter Blackreach, you must first lower spears blocking access to the lift in Blackreach, by activating a button on a sculpted metal head in front. Then ride the lift up and use a lever to open a gate in Skyrim. Once this has been achieved, the way will remain permanently available. Despite not being clearable, and having no associated dungeon, the map may still show this location as "Cleared". There is a bug on the PS3 and PC Legendary version (perhaps on other versions on other consoles as well) which occurs when the great lifts are accessed from Blackreach. When the character reappears in Skyrim on the surface, the screen autosaves and then goes blank/black, reappears a few seconds later and then goes blank again. This continues to occur indefinitely; attempts to move/run/sprint and whirlwind sprint only result in the character reappearing at the original place of arrival after the screen reappears (after going black/blank). Bringing up the menu screen/favorites and letting it stay on the screen for 15 - 30 seconds stops the bug/glitch. This page was last modified on 1 December 2014, at 13:53.